NEW YORK, New York — The Hayastan All-Armenian Fund is putting the finishing touches on the new school of Gishi, a village in Artsakh’s Martuni Region. The project is being realized through a major contribution by the Vardanyan Family Foundation, with additional financing by the government of Artsakh. The initiative was launched in 2009, when the Hayastan All-Armenian Fund and the government of Artsakh joined forces to build a new school in Gishi, given the severely dilapidated state of the community’s existing campus. The new school is designed to accommodate 300 students (today there are 170 students in Gishi). The two-story structure has all the amenities of a state-of-the-art educational institution. It features 12 classrooms, a teachers’ room, a principal’s office, a library, an events hall, a gym, a cafeteria, and a health clinic as well as classrooms for biology, chemistry, and civil-defense instruction. The building is equipped with central heating and air-conditioning. With the construction and decoration of the structure completed, currently crews are landscaping the school yard as well as building a playground and a soccer field. These last enhancements are financed by the government of Artsakh. The executive director went on to express hope that the fund’s collaboration with the Vardanyan Family Foundation will continue well into the future, adding that the new Gishi school will stand out in terms of both esthetics and modern amenities. 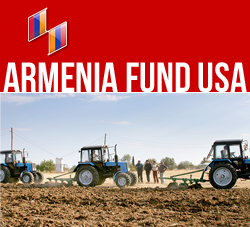 The Vardanyan Family Foundation has provided financial support for a host of infrastructure-development projects currently being implemented throughout Armenia and Artsakh. The foundation is also a major sponsor of various cultural and social initiatives.